What the lizardling empire lacks in creativity it makes up for in training. Its archers can do terrible damage with their short bows. This is important, as they’re trained to maneuver around the rear of the battlefield and do damage from afar. A single good hit can take out an archer, but it can do considerable damage before that. Archers always remain organized into a unit under a Commander (statted out separately), who strides into combat and calls orders back to its unit. Bow Training. 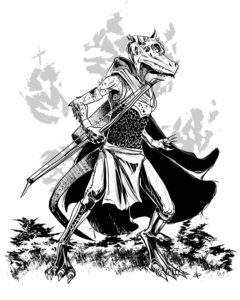 The lizardling deal an extra +2 damage on ranged attacks, and their range increases by 20 feet. Dagger. Melee Weapon Attack: +4 to hit, reach 5 ft., one target. 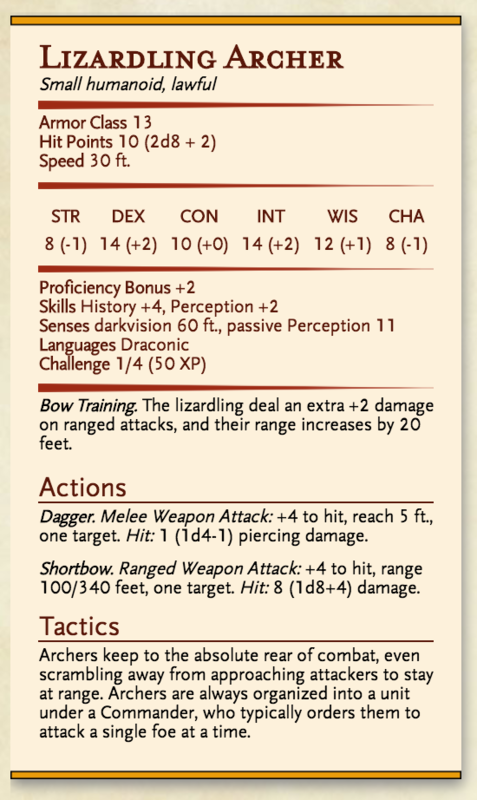 Hit: 1 (1d4-1) piercing damage. Shortbow. Ranged Weapon Attack: +4 to hit, range 100/340 feet, one target. Hit: 8 (1d8+4) damage. Archers keep to the absolute rear of combat, even scrambling away from approaching attackers to stay at range. Archers are always organized into a unit under a Commander, who typically orders them to attack a single foe at a time.